Flamboyant vocalist Jeffrey Hoad and his brother Clifford Hoad were playing with the Young Lions until guitarist Bob Spencer left to join the Angels in 1986. With the dissolution of the Young Lions, the Hoad brothers formed Kings of the Sun and signed to Mushroom Records. The new band's debut single, "Bottom of My Heart"/"Bad Love," would prove to be Kings of the Sun's biggest hit, eventually reaching the national Top 20. They almost disbanded at the end of 1996 before RCA executive Simon Lowe signed the band after seeing them perform in their hometown of Sydney. The band toured the U.S. during 1987 before beginning work on their debut album with producer/engineer Eddie Kramer (Jimi Hendrix, Led Zeppelin, Rolling Stones). Guitarist Ron Thiessen had left the band and Jeffrey Hoad's guitar work appeared on their self-titled debut, released in October 1988, before guitarist Glen Morris joined. The album produced the singles "Serpentine"/"Wild Cat" (July) and "Black Leather"/"Bad Love" (October). The band toured the U.S. supporting Joe Satriani, followed by Europe supporting Kiss, and returned to Australia at the end of 1988. Supporting the touring Guns N' Roses at the Sydney Entertainment Centre proved a disastrous move for Kings of the Sun, thanks in part to the efforts of lead singer Jeffrey Hoad, who dropped his pants in front of the audience and bad-mouthed Guns N' Roses publicly. This spat between Axl Rose and the band led to the Australian public turning their backs on the band. 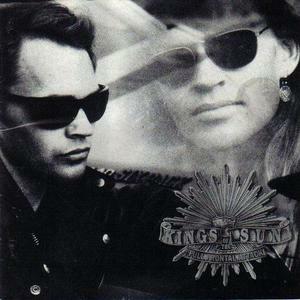 They continued touring overseas, however, and after Morris briefly left mid-1989 to join the Screaming Tribesmen, Kings of the Sun released their second album, Full Frontal Attack (August 1990). Two singles were released: "Drop the Gun"/"Haunt You Baby" and "I Get Lonely," before the band returned to the U.S. to support Lita Ford.